Samsung’s B.K. Yoon, the president of its Consumer Electronics group, gave an inspiring call to openness for the internet of things in a keynote speech at International CES on Monday night that also happened to contain a few tidbits of news about the SmartThings smart home platform that Samsung purchased last summer. 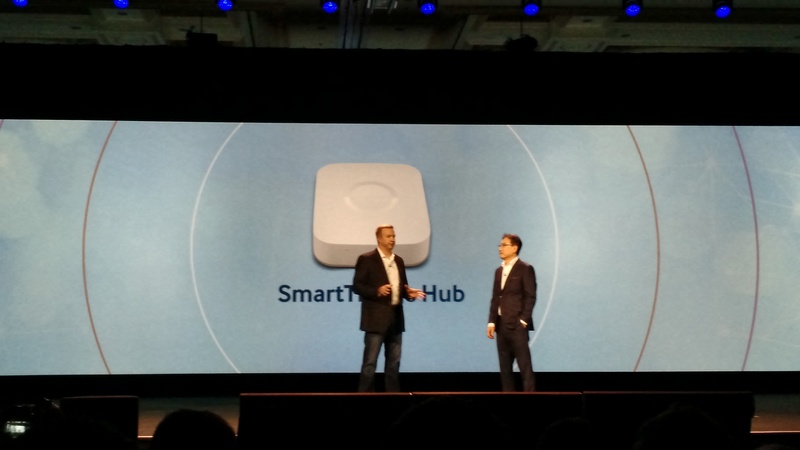 In a conversation last night with Alex Hawkinson, the CEO of SmartThings (shown above with the version 2 of the hub), I found a bit more about the next generation hub planned for April as well as the new premium service tier that will also be coming out in that time frame. I also learned that while the hub will support “legacy” standards like Z-wave and ZigBee while adding Bluetooth Smart, SmartThings is looking ahead to new standards and is planning to support Thread, the mesh-radio protocol that Nest and others have proposed as well as Intel’s Open Interconnect Consortium. Hawkinson said that if the devices come, they would also support AllJoyn as well. But let’s focus on the hubs for a moment, because that’s what the die-hard smarthome folks are most interested in. First off, the second generation of the hub is about the same size, although square with rounded edges and heavier than the current hub. That’s because it has a set of batteries in there so when your power goes out your hub stays on. There’s also room for a cellular USB stick if you wish, so you can also have backup internet (See correction note below). Hawkinson said it has always bothered him that given his reason for starting SmartThings — the flooding of his Colorado vacation home — the current version of the product wouldn’t have actually helped because the power was out. Now, the version two of his product would have actually helped. That brings us to the premium service level announced. Hawkinson said that people wanted things that the infrastructure couldn’t provide without costing SmartThings money, such as video storage (the hub didn’t have video capability either, but the new one will) and alert escalation. So now when an alert happens, users can set up chains of contacts that can take a call or texts. If a child coming home from school doesn’t trigger an alert a parent might get a text and then a neighbor. If a leak is detected, maybe the escalation goes to a plumber. This isn’t just a revenue opportunity in terms of charging the customer, it’s also a way to get service providers like HVAC repairmen, plumbers and others involved in the smarthome. Imagine if when you are setting up your SmartThings smarthome and you activate your water sensor and you get a list of local plumbers to call as part of the escalation service. If they get a call, SmartThings gets a referral fee. It’s like AdWords for the real world. What if when you sign up for this, your home insurer gives you a discount? It might offset somewhat the fee that SmartThings charges. It might not. Hawkinson was mum on the fees for the new hub, the premium service and any other pricing. Other things to note about the launch are that several new devices and products will be supported by SmartThings, such as Chamberlain garage doors, Honeywell Thermostats, Nest Thermostats, Philips Hue lights, Netgear products, August locks, the previously announced Samsung appliances and new apps for the Gear S and Samsung Smart TVs. The app will get an update too with more suggested use cases while still letting people program crazy ideas if they want. The sensors will also shrink to about a third of their current size and we’ll see SmartThings eventually move to use Samsung’s Tizen OS according to SmartThings co-founder and CTO Jeff Hagins. That last tidbit is especially interesting when you consider that Samsung said that Tizen would be the OS for all of its Smart TVs going forward, and that Yoon said that Samsung plans to eventually make every device it sells into a hub for the internet of things. It sounds like Samsung may be trying to push Tizen as the OS for the internet of things after losing out on mobile to iOS and Android. Correction: The original article stated that the version 2 SmartThings hub “has room for a SIM card” for backup connectivity. The article was updated at 3p.m. PT to correct that it does not have room for a SIM card, but a cellular USB stick can be used for backup cell connectivity. Anyone know when hub 2.0 will come out? Or you could have SmartThings turn off the water via a Zwave controlled valve which the total component costs came to less than 50 bucks. Works like a charm. So, I find it interesting that Hawkinson started SmartThings because of flooding in his Colorado home. We have something in common there as flooding in my home also motivated me to dig into home automation, but with an emphasis on protecting my investment and saving on energy versus automation for the coolness factor. So, I found the WaterCop, which, in my humble opinion, goes one step further in preventing home flooding – it shuts off the water in your house when a leak is detected. I am surprised that there are no competitors to the WaterCop in the IoT space – at least I haven’t found anyone else doing the same thing (actually shutting off the water). That said, I’m enthusiastic about Samsung and SmartThings and now that they are including Nest and Thread, I will look very seriously at purchasing v2 of the hub.